"Our study shows that across the vast majority of the land surface, trees are becoming more limited by water," said first author Flurin Babst, who conducted the research at the UA Laboratory of Tree-Ring Research and the Swiss Federal Research Institute WSL in Zurich. "This is the first time that anybody has projected the tree growth responses to climate at a near-global scale," Babst said. Adding tree-ring data to the map allowed scientists to see whether the changes in climate during the 20th century corresponded to the changes in growth of the world's trees. UA co-author David Frank said, "We saw areas where, in the earlier part of the 20th century, temperature limited growth. But now we are seeing shifts towards moisture-drought limitation." "That's much more than I expected," said Babst, who is now a research scientist at the Swiss Federal Research Institute WSL. "Reduced growth is indicative of increased stress on plants—which can be linked to mortality," he said. The team's paper "Twentieth century redistribution in climatic drivers of global tree growth" is scheduled for online publication in Science Advances on January 16. More information on co-authors and funding agencies is at the bottom of this news release. Since the advent of systematic satellite observations in the late 1970s, scientists can now study changes in vegetation growth over large areas by comparing satellite images of the same place over time and measuring "greenness" in the images. Greenness is a measure of how leafy the plants are and how fast they are growing. However, satellite observations weren't available for most of the 20th century. Moreover, measuring "greenness" in a satellite image can't tell how much individual plants grew from year to year. "Satellites only see the leaves—they don't see the wood where the carbon is stored," Babst said. "We wanted to provide a wood perspective." In addition, because the team's research combines the substantial database of growth data from tree rings all over the world with global climate data for the same time period, the new results will help test and improve computer models of how climate affects vegetation, Frank said. This study shows nothing. All it is saying is tree growth depends on water, it is not saying anything about the long term amount of water available. The reason for the nice pretty bands in the north is trees in colder climates have less time to grow, during their growth in the summer, water is the limiter. You notice the choice of periods excludes everything after 1990 which is 29 years ago. 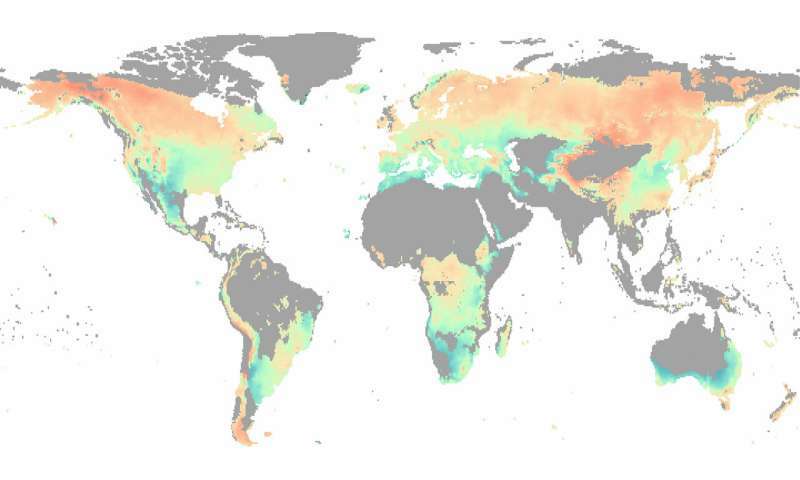 Per the satellite measurement studies, the world has been greening since 1980. I bet they exclude the data to make sure the results fit their conclusion they made when writing the proposal for a grant.